The most popular AKC knife. It is just “The Leverletto”, but this means a lot! 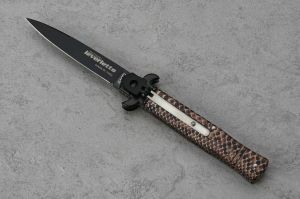 A knife designed by Bill DeShivs for AKC on 2007. It's a side opening knife. This is the tactical version. On the back there is a screw. If you turn it, it open only manually. Is very solid and works perfectly. Is the only tactical knife in the world with lever release mechanism. Suggested for everyday use. Overall Length: 8" Blade Length: 3.25"
***RETAIL ORDERS SHIP FREE IN USA!